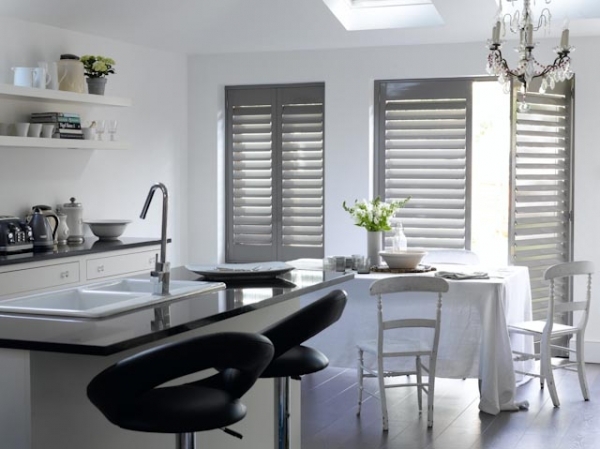 Plantation shutters are the absolute best choice for window dressing in a kitchen. The ability to clean quickly, alongside their durability and functionality, gives many benefits over curtains or even blinds. So what style of shutter is best for your room? As the Jona Lewie song suggests, the kitchen is one of the most lived in rooms and the centre of focus of the house. Whether it’s an old friend passing by and popping in for a quick cup of tea, to finding people ‘in the kitchen at parties’, you’ll need to make your kitchen into a workable yet pleasant area. As shown in the feature picture above, many kitchen/diners have doors leading onto patios or the garden. Shutters for patio doors are absolutely perfect, working especially well in recessed kitchen windows as in this case. In this modern kitchen design, wide slats with concealed push rods have been used to create a clean look. 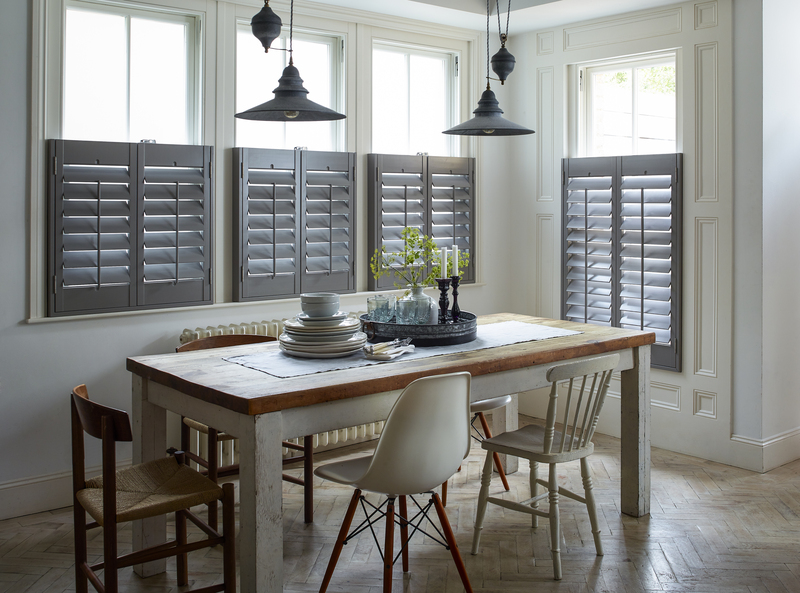 In this dining area shown above, café style shutters have been utilised to create privacy in this ground floor area. When thinking about dining room window ideas, café style is often the ‘go-to’ choice, as privacy can be kept – while still allowing maximum light into your room. These wooden kitchen shutters have been matched to the grey colouring of the lights to create a subtle, yet flowing look in the room. Our final tip, in kitchens like this first floor flat, windows are often smaller and inset to the room. These make a perfect area to have some fun with colour. 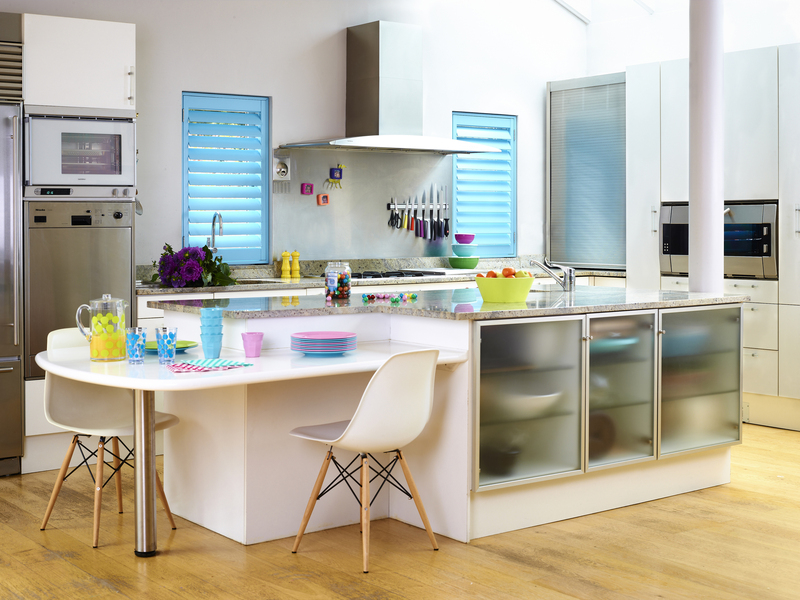 Make your kitchen ‘pop’ using a bright shade and make your shutters the focal point of the room. Not only does this make for an interesting design, it can also take focus of counter-tops – meaning you can utilise that space with more items without your kitchen appearing too ‘busy’. Discover more tips on Kitchen Window Shutters with Shutterly Fabulous. My husband and I are getting some kitchen renovations done and we want to get some new treatments for the windows to match the new cabinetry. I think that getting white shutters would look really nice with the new kitchen, and I like the idea of the plantation shutters. As you said, they’re easy to clean and durable, and I may take your advice and get some for the patio doors, as well.